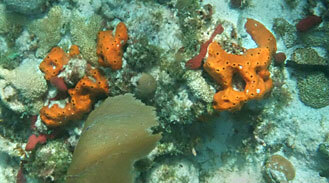 Snorkeling Coffins Patch - The Stake & The Donut - Great! Snorkeling Coffins Patch is fun and worth doing. Coffins Patch is a collection of about six different patches of reef in a variety of depths, and each very unique. We visited two, The Donut and The Stake, and most boat companies will take you to two or three spots. Sometimes companies refer to this trip as the Stake, because of a steel post sticking out of the water at an angle. To get there you take a medium length boat ride from the Marathon, Vaca Key area. The patch is about three and half miles offshore. 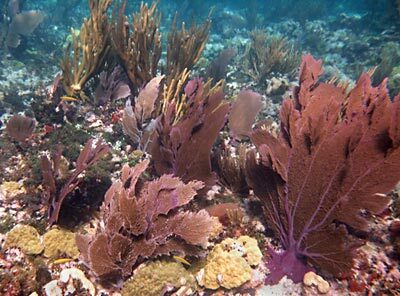 And although they are patches, they are close enough to the barrier reef that the water is clearer, and there are more species. 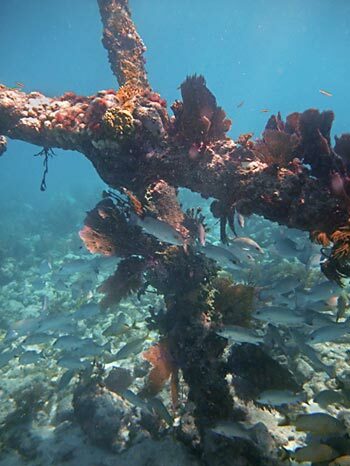 Like many of the reefs around this part of the Florida Keys, this location was named for a shipwreck (supposedly a ship carrying coffins). 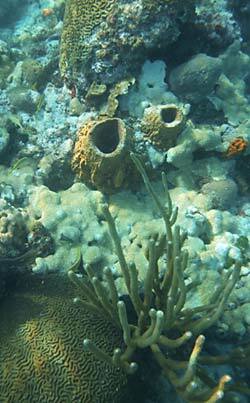 The Donut is just that, a round donut mound of rocks that sits in a bit deeper water, which makes it a better spot for divers than snorkelers. 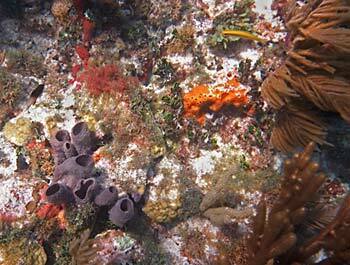 Still, we enjoyed this spot, and it is pretty interesting for snorkelers mainly for the abundance of beautiful sponges present here. There was a decent amount of fish at The Donut, but not as much as at other places. The depth was about 15 feet down to 20 feet. 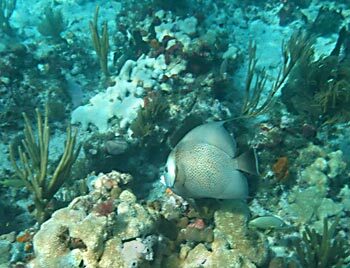 So unless you freedive, getting decent pictures was not that easy. There was a fair amount of sea rods and fans, but not a lot of coral here. Below you can see a Bubbling Neoprene we encountered here. They are fun to watch sometimes. 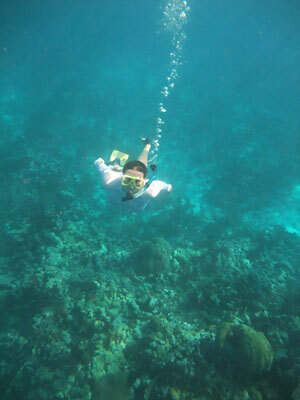 To get decent pictures Galen had to freedive down a bit. 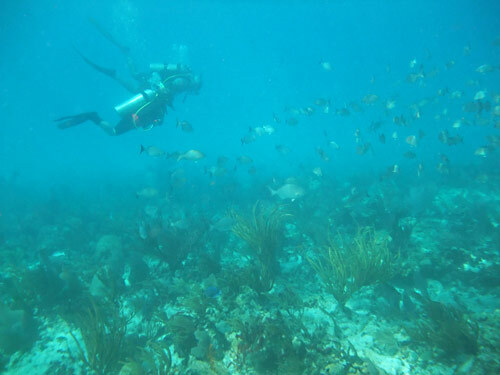 In this picture you can see him coming back up from taking a picture of the wonderful Hogfish and grouper in the pictures below. 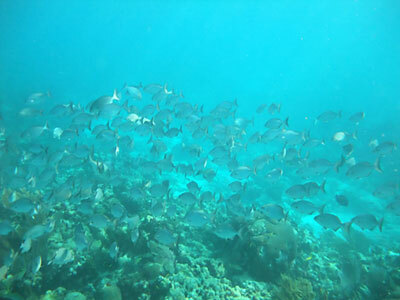 The Stake is much better for snorkelers, offering a nice shallow area that allows close viewing of a huge variety of fish. Below you can see what the area is named after, a stake that sticks up above water. 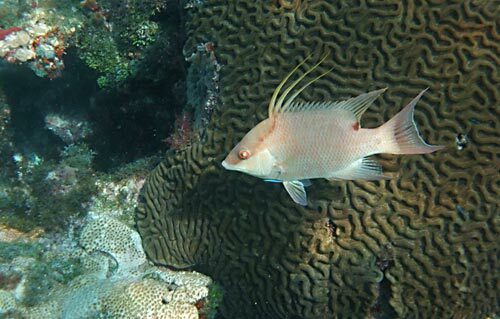 Nicole saw a Puddingwife Parrotfish that we had never seen before. 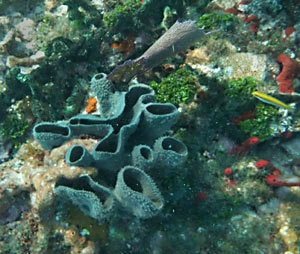 We also saw a nice Spotted Moray Eel, almost 4 feet, weaving through batches of rocks. 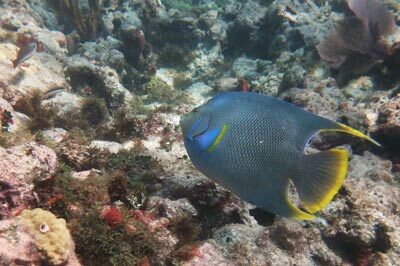 We saw lots of Yellowtail Snappers, Sergeant Majors (including the purple phase), Blue Angelfish, Foureye Butterflyfish, and Spotfin Butterflyfish. 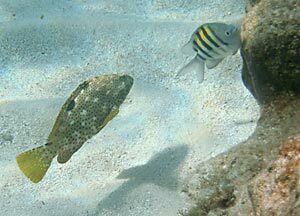 Also Gray Angelfish, Blue Tangs, Grunts, Porkfish, Bicolor Damselfish, Yellowtail Damsel, a good number of groupers, a Rock Hind, and a Tiger Grouper. 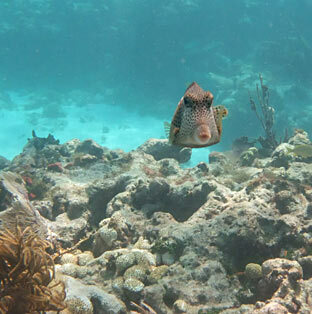 We found Midnight Parrotfish, young Rainbow Parrotfish, Striped Parrotfish, Spanish Hogfish, Yellowhead Wrasse, Goatfish, Flying Fish, Trumpetfish, Scrawled Cowfish, Spotted Trunkfish and a Lobster.